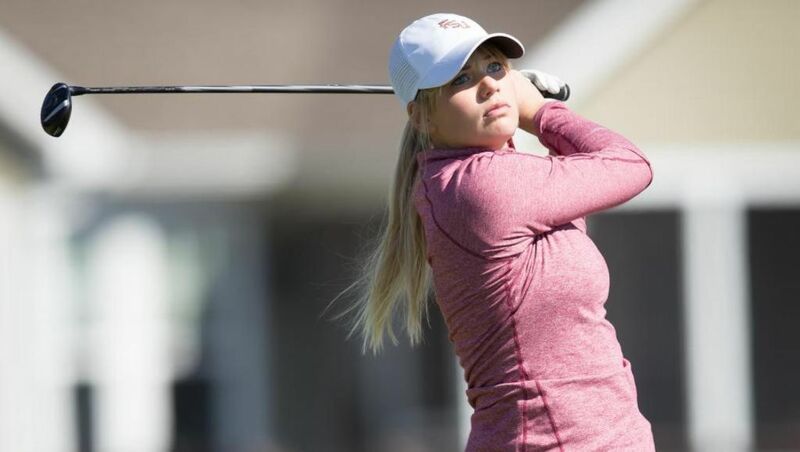 GREENSBORO, N.C. (seminoles.com) – Florida State junior All-American Matilda Castren is in a tie for ninth place in the individual standings and the No. 19 ranked Seminole women’s golf team is in seventh place in the team standings after the first round of the ACC Championships at the Sedgefield Country Club. Castren finished the round with a 1 over par score of 73 and is two strokes outside of the top five of the individual standings with two rounds remaining to be played. No. 18 Virginia, with three players in the top seven of the individual standings, is the team leader after the first round as they carded a score of 5 under par 283. The Cavaliers, who are looking to win their second consecutive ACC Championship, finished the first round as the only team under par. Wake Forest and Duke are tied for second place in the team standings (11 strokes behind Virginia). No. 3 Duke, the highest ranked squad in the 12-team event, has three players in the top 15of the individual standings. Jennifer Kupcho of Wake Forest and Lauren Coughlin of Virginia are tied for first in the individual standings. Both Kupcho and Coughlin shot identical scores of 6 under par 66. Castren (Espoo, Finland) put herself in great position to earn her third career top 11 finish in this event with a score of 1 under par 73. She closed extremely well as she was two strokes under par over her final 10 holes with two birdies and eight holes scored at par. Castren has now carded four of her last seven career round in her three ACC Championships at 73 or better including scores of 69 and 71 during the 2015 ACC Championships. Castren is looking to finish in the top 11 of the ACC Championship for the third time in her career. She finished in a tie for ninth place in earning All-ACC and All-American honors as a freshman and finished in a tie for 11th place as a sophomore. Castren is also playing for her seventh top 10 finish of her junior season and the 18th top 10 finish of her career. She earned a career-high eight top-10 finishes as a freshman. Junior captain Lydia Gumm (Radcliff, Ky.) shot a 3 over par score of 75 and is in a tie for 18th place in the individual standings. She, too, closed well as she was even par on the back nine with two birdies and five holes scored at par. Gumm was never more than three strokes over par at any time during the round and carded 13 total holes at par or better. Gumm has now scored six consecutive round in ACC Championships play at 75 or better. She finished in a tie for eighth place in the individual standings in 2015 and finished in a tie for 22nd in this event in 2014. She is averaging 72.83 strokes in her last six ACC Championship rounds. Gumm is playing for the sixth top-20 finish of her junior season. She finished in a career best tied for first at the spring 2016 Florida Challenge and earned top-10 finishes in both the fall 2015 Jim West Challenge (tied for ninth) and the spring 2016 Florida State Match-Up (tied for eighth). Sophomore Kayla Jones (Milton, Ga,) is also in a tie for 18th place in the individual standings with a 3 over par score of 75. She played her final 14 holes of the round at even par with two birdies and 10 holes scored a par. Jones was extremely steady on the back nine as she finished the round with eight consecutive holes scored at par. She was never more than three strokes over par during the round. Jones is playing in her second career ACC Championships event and looking for her first career top 20 finish. She finished in a tie for 36th place in 2015 ACC Championships. Gumm and Jones are only two strokes out of the top 10 and only four strokes outside of the top five of the individual standings. Florida State’s dynamic sister duo of Kim and Morgane Metraux are in a tie for 28th and a tie for 37th place, respectively. Kim Metraux carded two birdies and 10 holes scored at par and finished with a score of 76. Morgane Metraux closed as well as she was one of three players in the field with birdies on her final two holes of the round and carded a 77. Florida State begins its climb to the top of the team standings in the second round with tee times beginning at 8:50 a.m. The Seminoles are paired with Boston College and Miami in the second wave of the round. NOTES: Each of Florida State’s five players carded two birdies each during the first round of play…Florida State, Virginia and Duke were the only three teams in the field that had each of its five players score multiple birdies during the round…Florida State is the third highest ranked of the 12 teams in the event…the Seminoles are ranked 19th nationally by Golfstat after ranking as high as 17thduring the regular season (week of Match 7-13)…Florida State has finished in the top seven in the team standings in each of its first 10 matches of the season….the Seminoles have earned two team championships (fall 2015 Jacksonville Classic and spring 2016 Florida State Match-Up) and have finished in eight of their 10 events including the last two tournaments they have played in (fifth place at the Briar’s Creek Invitational and third place at the Bryan National Collegiate)…the identical scores of 66 by Kupcho of Wake Forest and Coughlin of Virginia were one stroke off of the ACC Championships record of 65 by Florida State’s Kristin Tamulis in 2003.